A listing of all Kauai Beaches can be found on these pages. Check for the beach that will be perfect for you! First things first. Kauai beaches are dangerous! Yes, of course beaches in Kauai are among the very most beautiful beaches on the planet, but they are dangerous. All of them are. 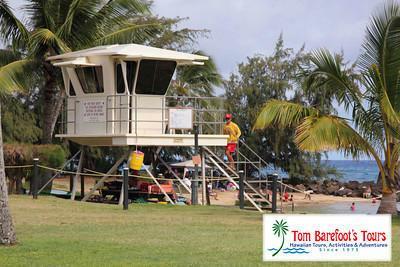 Over the span of time between 1970 and 1999 there were 193 drownings on Kauai beaches. The vast majority of those that drowned were visitors to the island, but 27% of them were island residents who in all likelihood were aware of the dangerous ocean conditions that exist on almost every beach on Kauai and they still were caught by the ocean's fury. People drown on all the islands of Hawaii but beaches on Kauai have a particularly dangerous reputation most likely because they are so open to the outside ocean with no other land mass but its own shoreline to break the ocean swells. It sits a full two-thousand miles from any other land mass in all directions and the storms generated from even distant areas will bring waves and rough conditions and currents to each beach on this small but beautiful island. The bigger and rougher surf occurs in the winter months and primarily hits the northern exposed coastlines of the island where as the smaller summer south swell surf hits the southern shores in the summer. Both are dangerous, in fact the percentage of drownings in the summer can often approximate the winter months on many of these beaches. Some beach locations are of course more dangerous than others but our main mantra in this section of our website is that "they are always dangerous". Although we will include most of the beaches on the island in this section we will only recommend that you swim at beaches that have lifeguards and even at these, that you only go in after you have asked the lifeguards what portion of the beach you should be swimming at on that particular day as conditions vary daily. The lifeguarded beaches have drownings as well which is why we advise you to take this extra precaution. Enjoy Your Kauai Beach. These Beaches are among the most beautiful in the world. Now, if we haven't petrified you to the point of not wanting to get into the water at all, if you take the precautions we've outlined above seriously, you can and should have a great time at the beach. These beaches of Kauai are beyond beautiful as evidenced by the fact that Hollywood has spent millions of dollars coming to this island to film movies at these spectacular beach locations. The water is generally pleasantly warm, the sand is a delight, the vistas and views are picture postcard perfect and the ocean activities on Kauai rank at the top of the list of fun things to do here. If you think first and you are smart about it, your days at the beach on Kauai will offer a highlight to your Hawaiian vacation. The Big Island often gets a pretty bad rap when it comes to beaches. Yes, it is true that it is the newest of the Hawaiian islands and as a result it has not had enough geological time pass by to jump-start the laws of physics and allow nature to work its magic on creating the type of amazing beaches that can often be found on other islands of the Hawaiian chain. Tom Barefoot's Tours has compiled the most comprehensive Hawaii Beach Guide on the web. Our comprehensive beach guide contains information, pictures and directions to all of Hawaii's best beaches. The shoreline of Maui is truly one of the island's greatest treasures. Whether you're looking to go for a snorkel, catch some waves, or simply spend some time relaxing on the beach the Tom Barefoot's Online Hawaii Guidebook will provide you with the information you need to decide where the best place is to find exactly the experience you're looking for. A listing of all Oahu Beaches can be found on these pages. Check for the Oahu Beach that will be perfect for you!It's a good thing you're going to the beach on Oahu! Not only does Oahu have some of the most beautiful beaches in the state, have some of the best snorkeling to be seen in the state, have some of the best surfing, kayaking and stand-up paddling locations in the state and some of the largest waves for you to watch in the state, but Oahu beaches have more lifeguard locations and more lifeguards all toll than any other island in the State of Hawaii. Anahola Beach is a great choice for a beach on Kauai. Not only is Anahola picturesque with scenic vistas and a great expanse of beautiful white sand but its protective outer reef of Anahola Bay makes it a less dangerous area in which to enjoy the water than many other beach locations. Anini Beach is a narrow sliver of a beach that extends along Kauai's North Shore for somewhat over two miles. Anini Beach is an oddity on the North Shore because it is largely protected by a huge fringe reef that is one of the largest in the state. The Kauai beach with the unusual name, Donkey Beach, is a beach that comes with a lot of pluses and minuses. On the plus side, it is gorgeous in all its rugged beauty. Glass Beach near Port Allen is truly one of the oddest beaches you will find on Kauai, or anyplace else for that matter. Glass Beach is not a beach for swimming, or even getting into the water, but it is a beach to explore. Hanalei Bay is by far the largest bay on Kauai and is the heart and soul of all the beaches on the North Shore. The area upon which the ocean touches the shores of the bay is what is known as Hanalei Beach the this colossal spectacle of a beach is perhaps two-miles long and in most places over 100' wide. Hanamaulu Beach is located a short 3 miles north of Lihue and is protected from the ocean by the large Hanamaulu Bay. This bay is very picturesque and in the day served as the backdrop for the film "Donavan's Reef" starring John Wayne. Hideaways beach is a small sliver of a beach perhaps only one-hundred yards long which is located down the side of an extremely steep cliff at Princeville. Kalihiwai Beach is one of the truly beautiful North Shore Beaches. It is scenically positioned between two prominent points of land and its perfect crescent shape is first noticeable as you get a glimpse of the bay when driving down the roadway which dead-ends at the beach itself. Like so many beaches on the North Shore of Kauai safety is a big issue for Ke'e Beach. This remarkably beautiful beach has been the scene of many drownings over the years and everyone entering the water here needs to be able to access the dangers clearly. The wide expanse of Kealia Beach can readily be seen when driving up the Kuhio Highway just north of the town of Kapaa. The beach is perhaps a half of a mile in length and 150 feet wide in most places. Kekaha Beach is essentially the last portion of the beautiful 12-mile white sand beach that begins at the southern end of the NaPali Cliffs at Polihale and works its way down the coast. Lawai Beach is a small but beautiful sliver of a white sand beach that is located just off the coastal road in the Poipu Resort area. Though it does not have a lifeguard tower it often has suitable conditions for snorkeling and there is plenty to see under the surface. Lumahai Beach is Kauai's equivalent of the Venus Fly Trap. A case could be made that this may perhaps be the most beautiful beach on the island. Because of its beauty Lumahai Beach was the spot that was chosen to film South Pacific and it is hard to take a photo of this beach that does not come out picture postcard perfect. If you are looking for what is probably the most "family friendly" beach and beach park on Kauai you will find it at Lydgate Beach Park. You can tell that a lot of thought and caring came together at the same time in the construction of this beach area. In many ways the Mahaulepu Beach experience is more of a hiking adventure than a traditional beach outing. The beautiful sands of Mahaulepu Beach are essentially the hiking path that will take you on a two mile journey starting from Shipwreck Beach in Poipu all the way to the cliffs on the eastern side. Picturesque is a word that could easily be used to describe Moloa'a Bay. The few vacation rentals that dot this east side bay obviously have the same point of view, as their beachfront locations make a memorable impression in any photograph and aid in luring potential clients to their scenic ocean retreats. Any list of comparable items will consist of more favorable and less favorable choices whether it be a list of vacation rentals to stay at or a choice of cheeses to bring to a picnic. One of the most popular beaches on Kauai, and one of the most "people friendly" is Poipu Beach in the midst of the Poipu Resort. It would be a safe guess that the reason the resort is even here at all is because of beautiful Poipu Beach. Polihale Beach is spectacular by all measures of comparison and almost every description of this beach requires the use of a superlative. This is the longest beach in all of Hawaii stretching a full 12 miles in length. The only reason we are including the Queen's Bath on our list of beaches on Kauai is to dissuade you from going there at all. At the time of this writing I am not exactly certain how many people have lost their lives here but a year has passed by since the official tally had reached 29 persons. Rock Quarry Beach provides the visitor with a "mixed bag". The beach, which is also known as Kahili Beach, is rustic in its own way and has a certain charm as it provides a beautiful white sand beach that is rimmed with Ironwood Trees. As far as beaches go on Kauai, Salt Pond is one of the most people friendly. Foremost in importance is that it has a lifeguard on duty. Secondly, it has all the amenities you would need at the beach. Another one of Kauai's spectacularly beautiful beaches is Secret Beach. This long series of gorgeous white sand beaches can be readily seen from the Kilauea Lighthouse as you look toward the Na Pali Coastline. An incredibly beautiful white sand beach can be found at the eastern end of the Poipu Resort called "Shipwreck Beach". The beach takes its name from the ruins of an ill-fated vessel that crashed upon its shores years ago but has since been completely consumed by the sea. If you've ever had an opportunity to see the North Shore of Kauai from the air on a helicopter or a fixed-wing aircraft you will have had little trouble recognizing a huge reef that protrudes outward from the coastline on the eastern side of the NaPali Coast.